Hoping For More: Having Cancer, Talking Faith, and Accepting Grace is a story of a young religion professor — who is also a wife, mother, daughter, sister, and friend — searching for words adequate to express her faltering faith amid the grief and grace of the newly fractured life. More Anne Lamott meets Harold Kushner then the teller of a pious, God-saved-me-from-cancer tale, Thompson unpacks the messy realities that arise when faith and suffering collide. Told in shimmering prose, Hoping for More takes readers on unsentimental journey through the valley of the shadow of cancer beyond the predictable parameters of prayer, the church, even believe in life after death. What emerges is a novel approach to talking faith and accepting grace when hope is all you’ve got. Readers with questions about suffering, illness, and faith, as well as pastors, clergy, and theologians looking for an empathetic guide through the confusing world of caner and medicine will find Hoping for More to be an invaluable resource. Deanna and her family and were featured on local public television affiliate’s (TPT) companion piece to “The Emperor of All Maladies,” the new Ken Burns documentary on the history of cancer based on the book of the same name. The TPT feature is called “Living Beyond Cancer,” looking at five local people who live with–and sometimes beyond–cancer. It first aired Monday, March 30, evening after the Ken Burns documentary. Click here to see all the TPT airings of the show. It was initially created for a summer 2013 sermon series called “Since You Asked” for a sermon on “What do you do when a Friend Has Cancer?” The video is in four segments and closely follows the book. Hoping for More // the story of Deanna Thompson from Lutheran Church of Hope on Vimeo. We tend to use words like “miracle” and “mystery” in the context of serendipity. 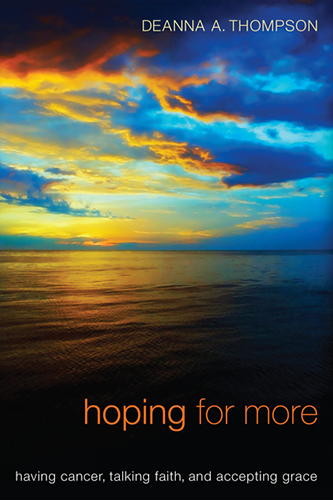 In this frank and eloquent account of life transformed by cancer, Deanna Thompson explores these articles of faith as they are also wont to appear, on the hard edges of hope and the dark side of joy. I have known Deanna Thompson since we were both studying at Yale Divinity School in the early 1990s. She was a few years younger and headed for a career in academia. I was struck by the purity of her intelligence and joy. Then, we met again in Minnesota, where we both landed. I remember musing to myself at the good fortune of her students at Hamline University, where she became a professor. “Getting paid to talk about God is a pretty sweet deal,” she writes, as this book opens. Her delight in the work of theology and the art of teaching was always evident and infectious. The new conversation with God that she began after her diagnosis of Stage IV cancer is a conversation that countless people are having in our time. Medicine is sometimes in the business of documentable miracles, and maybe it will cure cancer one day. But for now, cancer in all its variety is a rampant reminder to modernity that we are mortal. Still, when it strikes a person as young and beautiful as Deanna Thompson, as full of promise, as beloved and necessary to her husband, young daughters, friends, and students, none of us can help but ask why.